You are currently browsing the tag archive for the ‘Conservation’ tag. So if you can’t bare another Trump vs Clinton, Brexit vs Remain story, let’s talk about Connections, my favourite topic. There is after all far more that unifies us than divides us. I was invited as a guest of the Institute of Social Innovation and Resilience at the University of Waterloo, Ontario, to take part in exploring social-ecological complexity, and in particular the role hedgerows and hedge-laying might play in designing “novel” or “designer” ecosystems ahead of the inevitable growth of the Toronto Golden Horseshoe. I’ll explore the detail of the project in a later blog, but for now it’s worth explaining how this invitation came about due to its almost serendipitous levels of connectivity. Before I joined the Surrey Wildlife Trust I ran a project for the People’s Trust for Endangered Species called Hedgerows for Dormice (HfD) (HfD Newsletter 2011) from 2009-12, for which I ran a series of workshops across England and Wales for Landowners about Hedgerow Management. Through this project I had joined Hedgelink which at the time was the UK BAP for Hedgerows Steering Group, and now goes from strength to strength as a technical advisory group on hedgerows which are a Habitat of Principal Importance for Nature Conservation in England. Through Hedgelink I met Nigel Adams, a countryside management professional specialising in hedge-laying, and vice-chair of the National Hedgelaying Society. I enlisted Nigel to help me with the HfD Hedgerow Management Workshop, providing a much-needed practical element of hedge management through his 10-point plan to compliment the positive wildlife message from my PTES project. Nigel also attended my NERC Workshop on Hedgerow Connectivity at Imperial College in 2014 and off the back of this he enlisted me in the 3-man mission (with Jef Gielen, a hedge-layer from the Netherlands) to Ontario to demonstrate the art of Hedge-laying. Nigel and the NHS had hosted the Waterloo team, headed up by Dr Steve Quilley and PhD Candidate Perin Ruttonsha, when they attended the National Hedgelaying Championships in 2015, and who subsequently invited him and Jef to take part in the all program at Waterloo in 2016. Nigel, Jef and I were intrigued by the invitation because we didn’t equate Canada with hedgerows, let alone hedgelaying. The team at Waterloo were tasked with finding a hedge for Nigel and Jef to demonstrate their art and it soon became clear that finding a suitable “hedge” was not easy. After arriving in Ontario on a Monday evening in September we went straight to work on Tuesday demonstrating hedge-laying on a small patch of shrubs at the Quilley’s property in Elora. I say “we” I am of course more an eager conservation hedge-layer rather than professional like my colleagues but the “hedge”, layed midland style, was soon shaping up. Until we ran out of shrubs to lay! Following this first demonstration we journeyed with our hosts from our base in Waterloo to Caledon and scoured Mount Wolfe Forest Farm for a suitable hedge to lay. Beautiful as the farm is, it did lack anything resembling a hedgerow although a line of trees along the edge of a woodland strip gave us the opportunity to demonstrate again. Assembled at Mount Wolfe to watch the demonstration were some of the posse that had been to the 2015 Hedge-laying Championships in the UK including Debbe Day Crandall (Save The Oak Ridges Moraine Coalition), Gord Macpherson (Toronto Region Conservation Authority), Karen Hutchinson (Caledon Countryside Alliance/ Albion Hills Community Farm) and Nicola Ross (Writer and Environmentalist), together with farm manager Sarah Dolamore, all keen to see how hedges and hedge-laying might be a useful tool in the conservation of the Oak Ridges Moraine Area. Of course there may also be social aspects to explain the lack of hedges. Settlers from Europe were in some cases disenfranchised by the theft of common land and its redistribution to wealthy landowners exemplified by the exclosure acts. During the enclosure acts of 1750-1850 over 200,000miles of hedgerow was planted enclosing over 2 million acres of land. Perhaps hedgerows represented a way of life settlers would rather forget. I will come back to this because I think it raises some challenging questions about how much social and cultural aspects should be considered when ecosystem functioning is threatened. The general consensus was that some trial hedges should be planted as soon as possible to answer some of these practical questions before hedgerows might be rolled out as a component of green infrastructure. After a busy week of hedgerows, harvest mice and River’s Week planning, time to relax…with a Dormouse Box Check! 9am in the woods at Furnace Place Estate (FPE), I met with Margaret, Wendy, Alan Mary and Nigel from the Haslemere Natural History Society (HNHS) who have been checking the boxes with me for the last two years. They were very patient through year one when we caught absolutely nothing vertebrate- not even a wood mouse! We’ve been rewarded this year with four individual dormice –two each male/female. We caught a pair in May, snoozing in their bracken and birch-leaf nest. We hoped they would breed but no sign yet. In June we picked up another male and July another female. We are able to identify individuals by giving them an individual fur-clip (requires L2 licence from Natural England). I’m back from the site now where we found one individual but unfortunately it was too quick for the surveyor. We use a “stuffer”-a duster- which goes in the hole in the box to prevent its occupants fleeing before it’s taken from the tree for processing. This sharp-eared dormouse must have heard us coming and was out before stuffer was..er…stuffed. Still, good to know the animals are still about even if we can’t know which of our animals that was. The Hazel Dormouse Muscardinus avellanarius is afforded the highest legal protection because of its declining UK population. It status as a European Protected Species (EPS) means that a licence is needed in order to survey and handle them. A Level 2 licence is needed to fur clip animals as part of a scientific study. Fur clipping helps us to identify individual animals and learn about their survival, breeding and dispersal (movement habits). This site will be registered as part of the National Dormouse Monitoring Programme run by Peoples Trust for Endangered Species so that our data can be used to keep track of the UK conservation status of these species. 49 dormice boxes at FPE set up in a grid pattern. By chance rather than by design the north-east tip of the grid eases out into more open habitat on Forestry Commission land (with their approval of course) which is regenerating woodland clear-fell. Of particular interest at this site is that all animals are being discovered in this habitat where birch, bramble and bracken dominates on very acid soils, and not in the oak-ash-hazel coppice woodland where the bulk of the boxes are. In fact we have caught nothing in two years in this habitat, not even a solitary wood-mouse. I’ve never come across this before in other sites I have monitored. Perhaps the dormice are hiding way up in the canopy and amongst the cavities and rot-holes in some rather splendid, rather tall oaks. Laughing. My own feeling is that the dark interior of this woodland provides less foraging opportunities than the scrub beyond. Studies from Europe show how Dormice respond very well to woodland management opening up the canopy and letting light into encourage understory growth of brambles and shrubs (e.g. 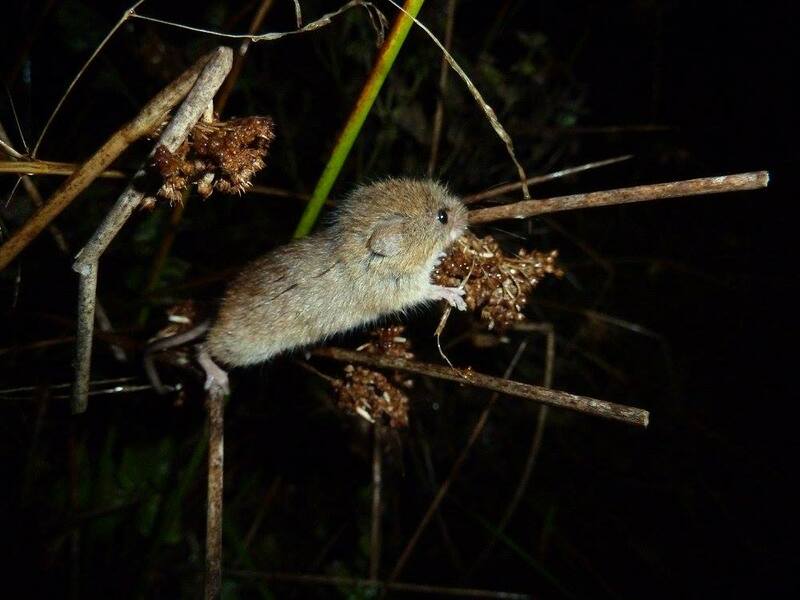 Ramakers_etal_2014; Juskaitis2008_CommonDormouse_pp90-93 ; Juskaitis2008_CommonDormouse_pp18-25). I don’t have the data to support this from our site however, and there continues to be a dearth of published studies in the UK since Morris/ Bright’s in the 1990s and therefore strong differences in opinion in what constitutes good woodland management with dormice in mind. Following the Forestry Commission’s Best Practice Guidelines is the current standard. In the meantime however here are some pictures of dormice nests composed of bracken and birch leaves without a bit of honeysuckle in sight. I’m very grateful to the The Barlow’s who own Furnace Place Estate for allowing Surrey Wildlife Trust to monitor these woods for Dormice in collaboration with NHNS who through their members Wendy and Allan Novelle, also dormice monitors, supplied the FPE project with boxes. Landowners, Communities and organisations like Surrey Wildlife Trust working together for the benefit of wildlife is an essential part of SWTs Living Landscape vision. Chris Packham claimed dormice were a “conservation con” a few years back to the outrage of the monitoring community, although I recall he was really just bemoaning the improbability of discovering one of these fascinating mammals in the normal process of being a naturalist. Its my hope that where schemes like these give people the chance to discover these sleepy characters in their own local woods along with other natural gems, a sense of value and pride can be fostered in local natural places, and a plan to invest in retaining them into the future can be drawn up. I started this blog back in 2013 to explore my interest in connectivity and how connections, being connected and conversely the state of isolation, is expressed throughout the living world. The hedgerow that joins to woods; a river flowing through the landscape; a story that brings together two communities. I think a lot- too much some might say, and blogging helps me to organise thoughts and also practice writing, which I have loved since I was a youngster but have done less of in my adult life. I became an ecologist in my 30s so came to a scientific way of thinking after years of intuitive living, and I feel keenly a loss of a creative side of my being. What better way to explore these ideas than connecting with others, and in the process reconnecting my left and right brain. My blogging has been at best sporadic and at worst non-existent; however, with the encouragement of the good people at WordPess with their Blogging101 course I’m going to invest in my blog in 2016! I am already nearly a week behind due to a house move, but rather than quite we will just accept and move on! Writing style- I tend to write longer mini-essays! Perfectionist streak- I don’t like posting things that aren’t high quality. Insight into the application of science though my job as Living Landscape Manager at Surrey Wildlife Trust, and in particular how research is translated into practical delivery methods. One of my core interests is to what degree ecological connectivity is woven into the life stories of our society, and how we can use these to build a more resilient and connected community. Local and national case studies about how communities are connecting with nature and natural resources in a more sustainable way. Stories, Pictures and practically anything else I can think of relating to this idea of connectivity. I hope you’ll join me and interact with your own experiences and ideas. These are hedges along a footpath to Guildford lane, which is to the south of White Lane.